"Power resides where men believe it resides. It's a trick, a shadow on the wall." Although the game's challenges resolve quickly, they are full of opportunities for cunning strategy, devious intrigues, and brokered alliances. When it is your turn, you reveal the top card of the event deck, and it indicates the player against whom you must initiate an encounter. Then you select one of your characters to participate in the challenge. Each of the five Great Houses represented in the game has five characters, although you will choose one of these characters to be your leader. You'll take that character's leader sheet and place it before you, and then you'll gain the support of the other four characters, each of whom will be represented by a token. When you are the challenger, you will choose one of these characters to move toward the center of the table, rotating it so that its sword icon is facing the player you're challenging. The defending player will then select a character and rotate it so that its shield icon faces you. At this point, anything can happen. You can head toward hostilities. You can agree to a truce. You can accept the support of another House, or you can deny that support… along with all the scheming and manipulation the offer was certain to signify. If, however, you choose to accept a player's support, that player chooses a character to participate in the encounter and then rotates it so that its sword faces the defending player (if joining on the challenger's side) or so that its shield faces the challenger (if lending its strength to the defender). If the challenger or defender accepts your support in an encounter, you become more than an idle bystander; suddenly, you get to share in the spoils or the disastrous results of failure. Each character's strength in a challenge is represented by the number of plastic crowns placed upon it, and if either the attacker or defender has accepted another player's support, the supporting character's strength is added to the side it supports. Still, the encounter isn't yet resolved. There's one more step—and one more chance to outmaneuver your opponents! Each player has access to a deck of cards, the House deck, that contains a number of different cards you can play during an encounter. These include cards you can use to declare a truce, as well as numerical cards, ranging in value from "1" to "20," that you can play to indicate and support your hostile intentions. The active players only enter a truce if both players play their Truce cards. Otherwise, the side with the higher total power value wins the encounter, and the players involved all claim their rewards or suffer their fates. Your primary goal in these encounters is to spread your influence to your opponents. By winning a hostile encounter as the challenger, you earn the right to place a point of influence upon the defender's influece board, but you can just as easily agree to spread influence to each other's influence boards during a truce. Beyond the spread of influence, though, there are other consequences to your challenges. You might draw cards. You might take hostages. Your characters might gain power, lose power, or even die. Even when you're not one of the active players, you put yourself at risk in every encounter you join. No matter which of the Great Houses you command in The Iron Throne, you'll also gain command of five of its most notable characters, and each of these brings his or her own unique talents to your cause. More than that, though, your characters' unique abilities are all inspired by the show, and when you introduce them to the game, they can thrill and surprise you in richly evocative fashion. What if the Stark player hadn't played a hostility card worth eight power? What if she had mistrusted the Tyrells' offer as support as much as the Lannisters' offer of truce? Perhaps, she could have placed Arya's special character card facedown, instead. 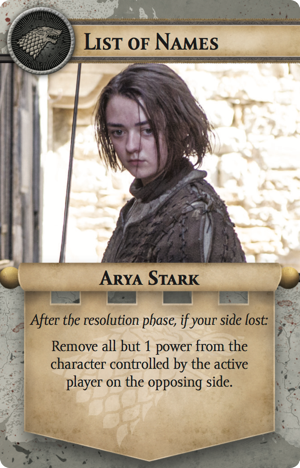 Character cards are worth zero power, so the Starks and Tyrells would have lost the challenge, but Arya's List of Names would have allowed her to remove all but one power from Joffrey. The variety of characters and their unique abilities lends the game tremendous replay value. 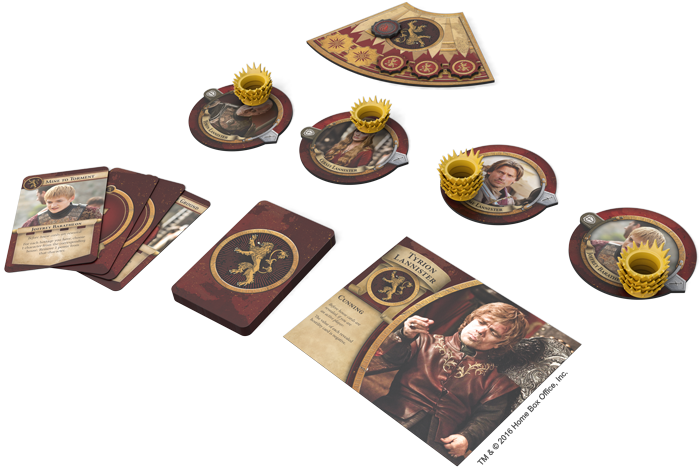 Games that you play as the opportunistic Lannisters do not feel the same as those that you play as the noble Starks. Simultaneously, the importance of your characters' abilities ensures that you'll come to care about their well-being. And over the course of your challenges, you'll feel as though your exploring the intrigues of an episode of Game of Thrones come to life on your tabletop. At the beginning of each game, you choose one of your five characters to be your leader. 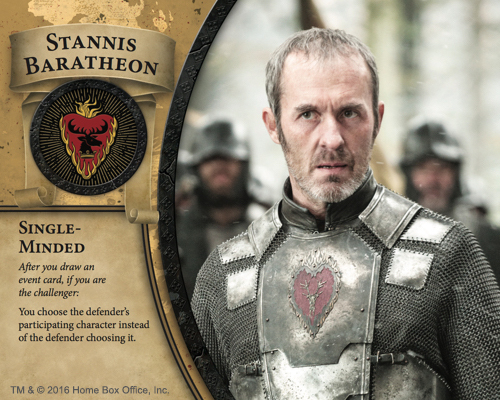 For example, if you play as House Baratheon and choose Stannis Baratheon as your leader, you take his leader sheet and place it before you. This means his unique Single-Minded ability becomes available to you throughout the game. However, you then set aside his character token. Instead, you place the other four character tokens before you, and those are the characters you'll be able to send into encounters. Even those characters can make unique contributions to your efforts. Each House deck contains ten character cards, two for each unique character, and you can play these only when the associated character is participating in a challenge. 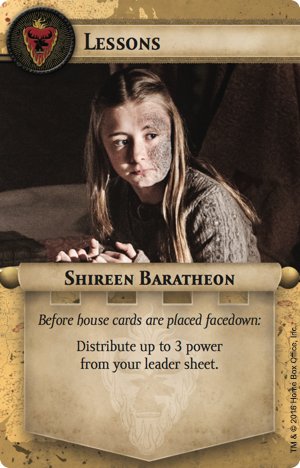 For instance, you might send Shireen Baratheon into an encounter and then play Lessons to load her with three of the power from your leader sheet. 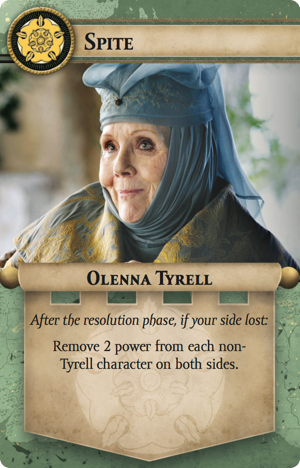 Or as House Tyrell, you might offer Olenna Tyrell's support to an opponent, only to reveal her Spite when your side loses. You can always play your leader's character cards, no matter which character you have participating in a challenge, but if any of your other characters are slain, you can no longer trigger their unique character card abilities. The result is that you'll want to keep your favorite characters alive… even as your opponents try to poison them, cut them down on the battlefield, or stab them in the back. You'll almost certainly need to make deals with other Houses in order to win the Iron Throne, but be wary of the deals you make! Sometimes, when you and the other active player both agree to a truce, you actually end up with… a truce! King Robert Baratheon is dead. The succession is in dispute. And the whole of the Seven Kingdoms are at stake. Can you lie, bribe, battle, and cajole your way to power? Can you seize the Iron Throne? 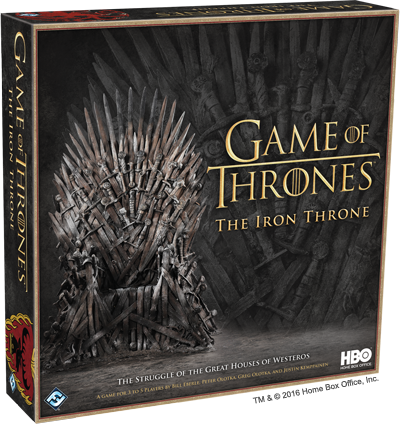 Stake your claim with Game of Thrones: The Iron Throne!